A popular department store is turning one this Easter and visitors to Bexleyheath can expect some unusual celebrations. 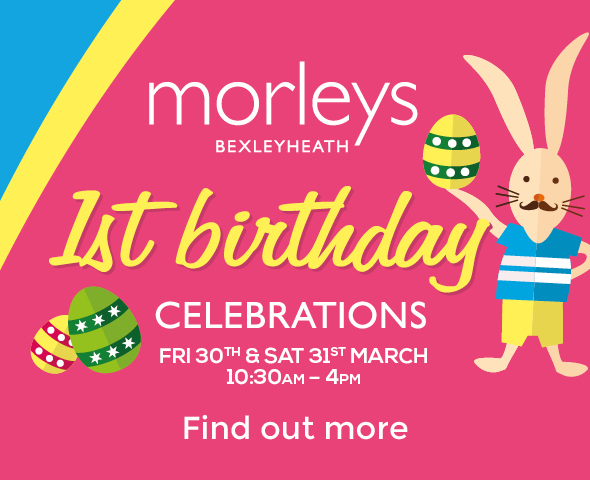 Broadway Shopping Centre will be hosting birthday events across the Easter weekend for Morleys, which include an 8ft, prize-giving Easter egg, stilt walking bunnies and a unicorn brass quartet to name but a few. The activities, which are all free to attend, will take place in the shopping centre on Friday 30th and Saturday 31st, between 10.30am and 4pm. Sean Doyle, store manager at Morleys Bexleyheath, said: “I am looking forward to welcoming everyone this weekend at our birthday celebrations. “We’ll have numerous surprises for guests on the day and plenty of prizes, as well as free Lindt chocolate, popcorn and candy floss. The event comes just one week after popular Australian Smiggle store opened its doors in Broadway Shopping Centre. The centre is now fully let, which Rai Holdstock, centre manager, says demonstrates the strength of Bexleyheath as a retail destination that major retailers want to be in. He said: “The free activities this weekend are designed to encourage families to spend a day out in Bexleyheath and help drive footfall to the town. “We have tried to include some rather unusual entertainment that you won’t find anywhere else in the area.